To be clear, it's not Best Waves — because every dog has its day — it's Important Waves. 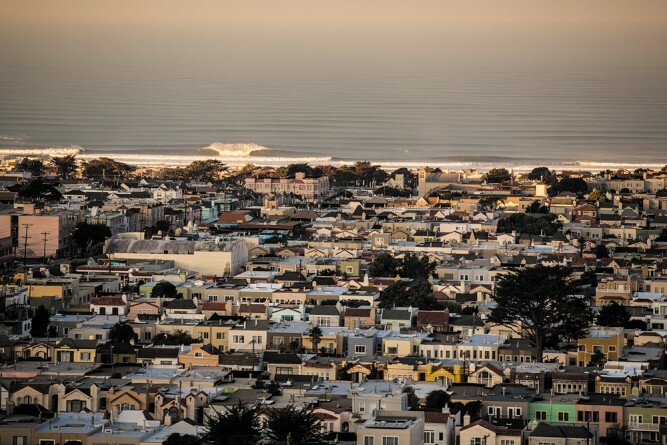 The type of waves that groom world-class talent, inspire media, host contests, turn boys to men, girls to women and influence surf culture in the continental US. We've chosen waves based on their modern-day impact, which is why you won't find waves like Malibu or Sebastian Inlet on the list. And to the Northeast and Pacific Northwest — we see you up there — but will respect your reclusive spirit. Everyone understand? Good. Let's explore. It's the best wave close to the most important city in the world. Balaram Stack. Leif Engstrom. Will Skudin. If you like big cities and hypothermia, you'll love Long Beach. Situated just one hour from The Big Apple, the south-facing beaches of #LongBeachNYnotCA turn most wintertime swells into a teepee-filled tube fest. Summer is mostly flat, but certain hurricane swells ignite the barrier island. Remember the Quik Pro New York in 2011? They definitely got lucky with the conditions, but that's an example of the quality that Long Beach can produce. Why? While the East Coast is pretty much just one long beachbreak (at least from Miami to New York), Lighthouse is consistently the best spot. 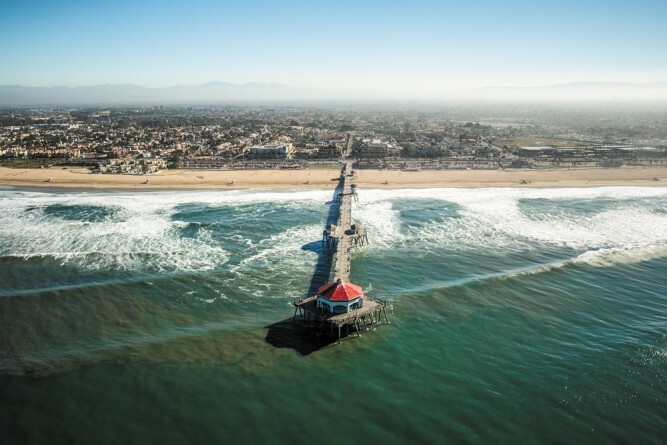 In fact, it might be the best beachbreak in America. Are we high? Maybe. But hear us out. It's not the biggest (Ocean Beach, San Francisco). Nor is it the most consistent. (Blacks Beach, San Diego). But when a giant low pressure moves off the Outer Banks of North Carolina and the winds swings around out of the west behind the front, nowhere in America offers a more challenging or squarer barrel. How else do you think Brett Barley got so good out at Pipeline? For a long time New Smyrna was considered "the other inlet" in Florida — the redheaded stepchild to Sebastian. But when the jetty at Sebastian was extended in early 2003, the infamous "first peak" was basically destroyed with it, and New Smyrna quickly took center stage in the Sunshine State. Today Smyrna is the most consistent wave on the East Coast, surfable on almost every day of the year, even during the typically flat summers. The inlet is responsible for the talents of Aaron Cormican, the Geiselman brothers and Nils and Noah Schweizer, and it's the only wave surfers in Florida can actually count on. How Puerto Escondido-sized barrels broke in front of the world's biggest tech hub and stayed under the radar for so long is a mystery. Blame it on the CTs visit or blame it on Instagram, but in the last five years OB has become recognized among the best beachbreaks in the world (about five times a year). On a good day, assuming you make it out, you'll share barrels with salty locals, visiting pros and Google employees, with the tip of the Golden Gate Bridge watching you from a just over the hill. 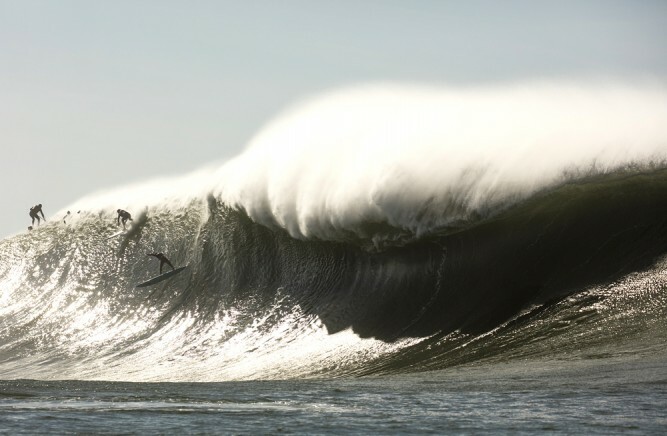 Hands down the best big wave on the mainland. Yes, it's groomed some of the best big-wave surfers from Santa Cruz and the Bay Area, but Maverick's has become the wave where even East Coasters and Southern Californians have migrated to test their mettle. If you can get past the frigid water, long hold downs, sharks and jagged rocks, you'll be treated with one of the most perfect slabs in the world. And if you're really good, you can become a Titan of Maverick's. Just mind your ps and qs. It's the Queen of the Coast, and our hearts, too. The long, perfect righthand pointbreak is unrivaled in the US, and has shaped so many of our favorite surfers, from Tom Curren to Dane Reynolds, Bobby Martinez to the Coffin brothers. It also serves as an R&D hub for Channel Islands Surfboards. While it is obscenely crowded, if you can get a wave to yourself, it's worth 10 anywhere else you would have surfed. 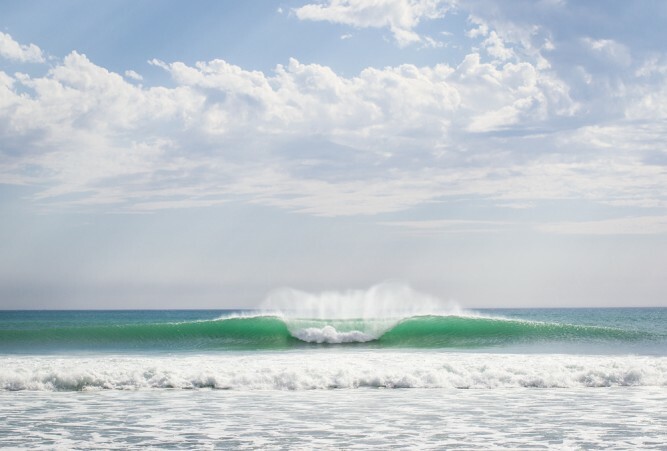 Arguably the most important wave in the world. 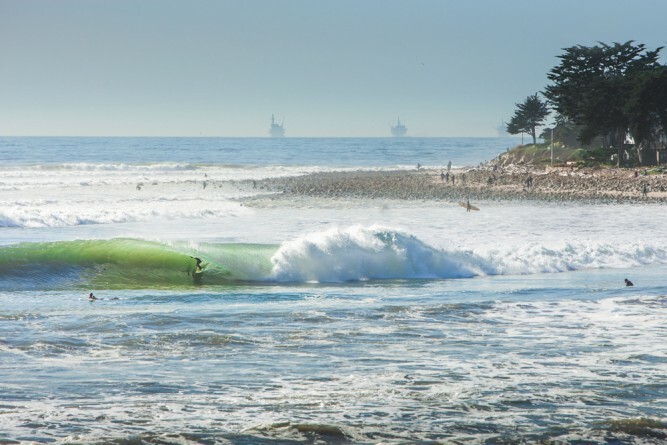 A high-performance playground, the cobblestone A-frame has become an international summer camp for any professional surfer trying to let his or her fins feel the warm Southern California air. 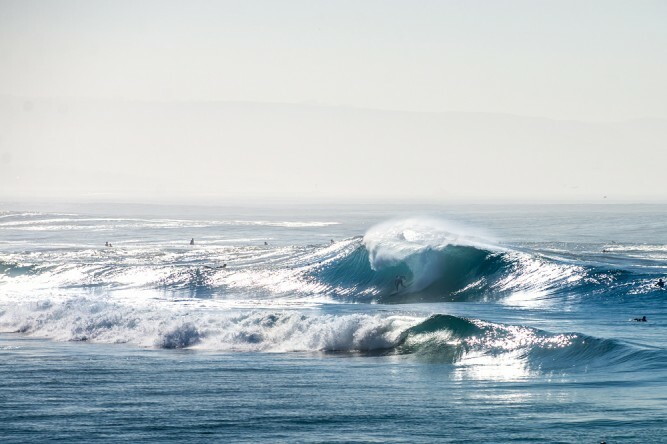 It hosts a QS and CT and at least one prestigious amateur event every year, and shaped the following surfers: Fletcher bros, Beschen bros, Gudauskas bros, Chris Ward, Nate Yeomans, Kolohe Andino, Griffin Colapinto and so many more. That it's next-door to industry and media doesn't hurt its visibility. Thanks to a submarine canyon just offshore, Black's magnifies swell and creates fun waves when it's flat and big waves when it's not. One of the few places in Southern California where you can ride a gun and get properly barreled. 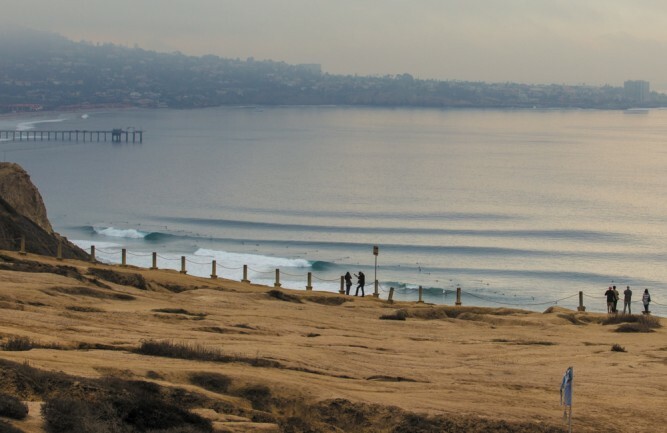 Wintertime swells provide humbling freshman hazing for the five colleges in the area, and dreamy lineups from the cliff provide decoration for every bedroom, notebook and shaping shack in the greater San Diego region. Is the wave good? Not typically. But it's the surf industry's backyard, a place that's birthed staple brands like Quiksilver and Volcom, and eccentric characters like Andrew Doheny and Alex Knost. Paddle out and chances are you'll see the guy that designed your boardshorts, the marketing manager that created its ad and the magazine publisher that printed it. It's a grindy wave, to be sure, but consistently more fun than it looks on the webcast. While this was the most debated wave on the list, we decided to include it because of the US Open, NSSA Nationals, Kanoa Igarashi and Brett Simpson. Also because "Surf City."